Developed to provide all the tools you to clean chimney flues completely. 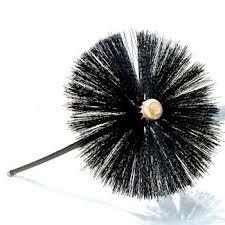 SweepsAll brushes are great for sweeping wood, oil and coal soot. For a stiffer rod use .440 fiberglass rods , 3/8" pipe thread. Keep all your rods in our heavy-duty 1050 Denier Ballistic Nylon rod caddy. Two pockets hold up to 20 rods. Also see our Proflex® Accessories!